Life is sweet for Amber Sawyer of Sawyer Stables in Burnett, Wis.–and not because she also works in a candy store. Her father, Dean, is celebrating his 50th year as an owner and trainer. Her 12-year-old son, Paul, is working in the barn and keeping up the family tradition. 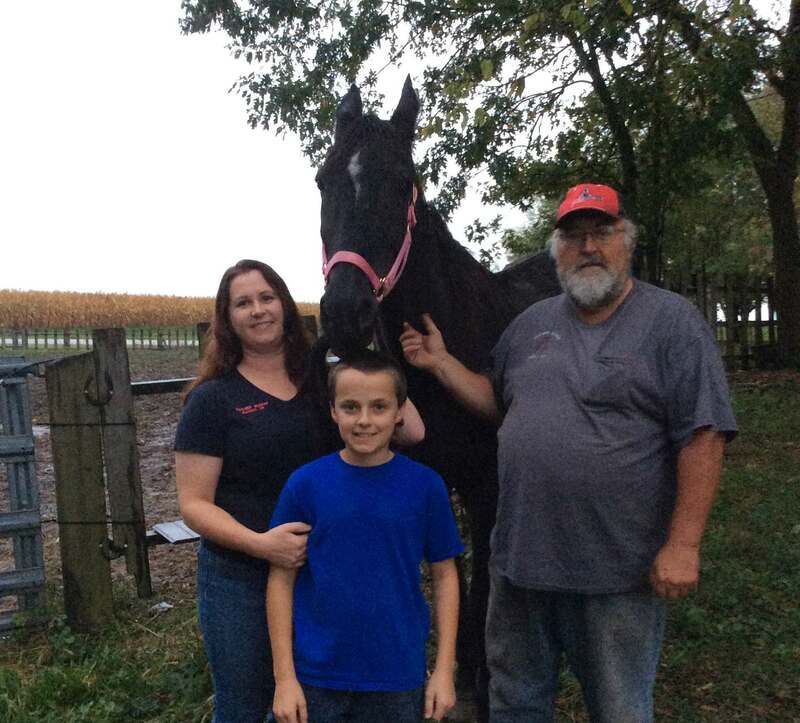 But the sweetest moment for Sawyer this past season occurred Sept. 2 at the Walworth County Fair in Elkhorn, Wis., when their 15-year-old black gelding, Mr Orchard Street, surged to a 2:06.2 victory for driver Larry Feilbach, who returned to the sulky after a 28-year hiatus. Co-owned by Dean, Amber and Paul, Mr Orchard Street is the oldest horse to have raced in the U.S. this year, according to USTA records. That distinction prompted Milwaukee Public Television to feature Mr Orchard Street and Amber, Dean, and Paul, scheduled for airing in February 2018. “It’s pretty rare when a horse is three years older than one of its owners,” said Amber. The gelding’s co-owners represent three generations: Dean Sawyer (right), his daughter, Amber; and Amber’s son Paul–who, at 12, is three years younger than Mr Orchard Street himself. USTA rules had once stipulated that a horse could not race past age 14, but in 2007, the rules were amended so that horses 15 years old and over, if healthy, can compete at fairs or in non-betting races. This year, Mr Orchard Street, by Orchard Street out of the Abercrombie mare Capriati, posted one win, three seconds and three thirds in 12 starts, good for $1,184 in earnings and $197,563 total over a 14-year career. The purse at Elkhorn was $800 from which the Sawyers took home $400, but the joy of watching him cross the finish line ahead of younger horses was, as they say, priceless. Amber’s father, who founded the family racing stable on 15 acres of property that includes a three-eighths-mile track, said they take in some horses with a goal of letting them finish their careers. “Then we try to find a good home for them,” he said. Feilbach, 59, a third-generation horseman from Juneau, Wis., is a building and grounds superintendent for the local school district. He once drove at fairs and at Quad City Downs in Illinois before focusing on his job and raising a family. Before this year, Feilbach had made his last start as a driver in 1989. He met Dean decades ago at the Dodge County Fairgrounds in Beaver Dam, Wis. Last year, Dean invited him to help out at the barn. That led to his driving Mr Orchard Street. 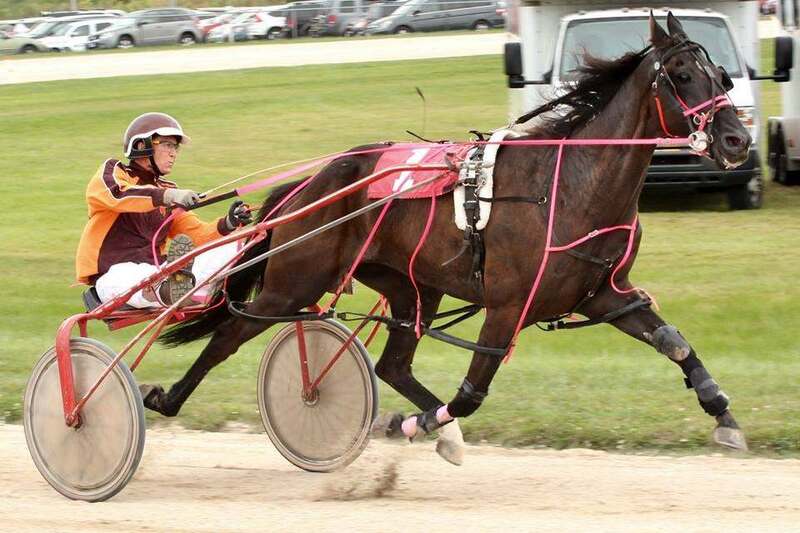 Feilbach’s first start with Mr Orchard Street was a second-place finish at the Mineral Point, Wis., Fairgrounds in June. They reached the winner’s circle in their eighth start together this year. “The biggest thing I had to adjust to after 28 years was being back in the traffic of the race, making decisions in a split second,” Feilbach said. “My only complaint is that my old silks seemed to have shrunk a little. Amber, 35, a veteran driver at Wisconsin fairs, also drove the Eastern circuit including tracks in Maine, Pennsylvania, New York, and Maryland. She had previous experience with older horses. 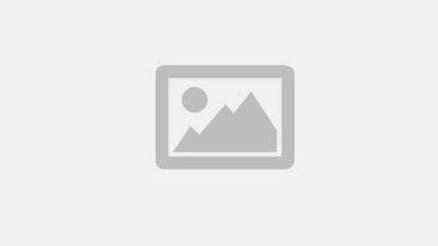 She took over the care and part ownership of Derek Bromac N, who had broken down while racing at Northfield Park in 2013, through a friend, Peter Kass, a former trainer-driver. Kass predicted the horse would bounce back and he was spot-on. “We raced him right through age 15, but he couldn’t make it back this season and now he has a home with us for life,” said Amber, who takes Derek Bromac N to the Midwest Horse Fair in Madison, Wis., to educate those in attendance about Standardbreds. In April, Kass was also instrumental in hooking up Amber with Frank Zimmer and his wife, Victoria Nafziger, who had owned Mr Orchard Street since 2007. “Mr Orchard Street won as a 14-year-old at Dayton, but when we felt it was time for him to retire and put him out to pasture, he would come back to the gate like he wanted to race,” said Zimmer. Zimmer and Nafziger said they wanted to find an appropriate home for Mr Orchard Street. Sawyer said that racing plans for Mr Orchard Street for 2018 are completely up to him. “We’ll see how he handles the winter and if he is healthy and sound,” she said.